A very fine, almost languid mousse. The nose takes a little coaxing at first, hints of cooking apples, wild strawberries with a touch of brioche and rose petals. Good definition. The palate is well defined, very good acidity, a little taciturn at first, lots of mineralite rather than fruit intensity, reserved and perhaps stony in character. Very precise, not the rose you would pour to seduce a woman but to show her you have taste. 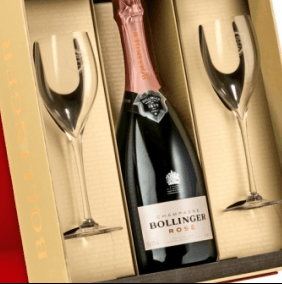 This wine has evolved not as a curiosity, but as with all of the Bollinger cuvées, as a careful assembly of the very finest ingredients by their talented, passionate team. In the meticulous House style, Bollinger Rosé is modelled on the Special Cuvée blend, combining the fruits of previous harvests plus the addition of reserve wines from their cellars in Ay. The final component, which provides colour and delicate aromas of ripe red fruits, is a proportion of still red wine coming exclusively from Bollinger's Grand Cru Vineyards in the Cote d'Ay and Verzenay.